“When in Rome do as the Romans do”. Kitchen is one of the best venue to probe one’s ingenuity. We have witnessed how eminent dishes metamorphised over time and over places from a simple recipe to a much complicated dishes much to the pleasure of our palate. This is true, because nothing can stop a real epicurean to cook and prepare their favorite meal even with the absence of the most important ingredient. Adaptation is the key. History proved itself how kitchen disasters and mishap brought something surprisingly good: the famous French pattisserie tarte tatin or the Pampanga’s local delicacy , Sisig. The bottom line of all these, when ingredients are rare count on our inventiveness on pulling it through. In our family next to rice pasta is the most consumed dish. Probably because of its versatility and the Italian blood in the family (ok very small percentage) :-). Anyways, when the family cravings for pasta comes (this happens once a week creativity is very important. Puttanesca is crowd pleaser and I already tasted similar dish making use of Philippines local anchovy, we call Tuyo. My husband abhors the smell of Tuyo, after all it is sun-dried sardines Filipinos eat in the morning breakfast with rice. So I immediately grab the occassion to make my husband appreciate this delicacy without him knowing it. 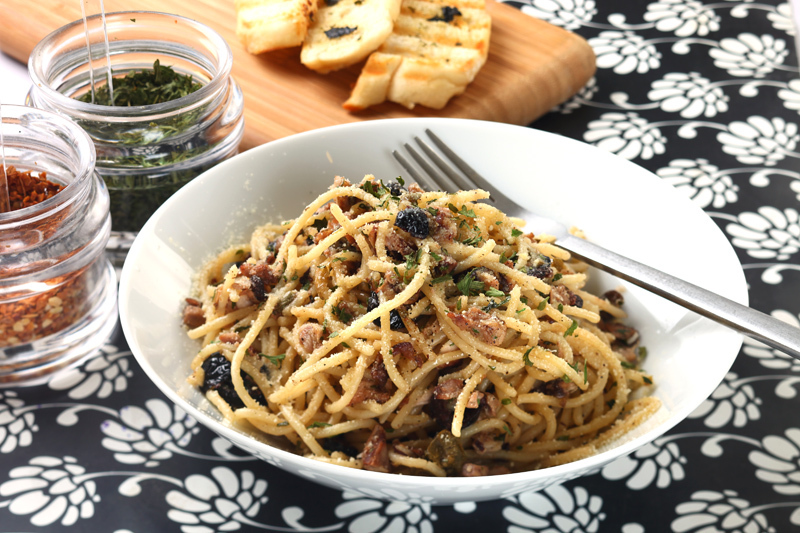 This puttanesca recipe is a great way to make your family eat a healthy packed meal. You can replace to you with other fishes if you have like Tinapa (Smoked Fish) , Tulingan (mackerel tuna) or yellow fin Tuna. Start first by boiling a lot of water in a big casseroleI, when it starts boiling add some salt and oil. Then put the spaghetti noodles. During this time put your sauce pan on the other stove and add some olive oil. Then fry the garlic, black and green olives and dried tomatoes. Check on the pasta it should be al dente by this time. Turn off the fire. Add the shreaded tuyo on the sauce pan with the garlic and olives. Then pour the pasta on your colander and put the pasta immediately on the saucepan with the tuyo. The liquid on the pasta will help avoid the dryness of the dish. Stir them, put some salt and pepper to taste. Add the lemon juice, chopped red chili (if you have cayenne powder you can add a pinch) and chopped basil leaves. Serve immediately with grated parmesan on the top. Procedure: Start first by frying all your tuyo, this will take about 2 to 3 minutes per tuyo. Set them aside and put in paper towel to dry excess oil. Once the fried tuyo are no longer hot to handle, take off the skin using your hand delicately. Then remove the primary bone followed by the rest of smaller bones. The result will be half a side of the dried skinless tuyo. Be careful not to break the fish. Once its done prepare your pan and add about 5 tablespoons of olive oil, then put the garlic then add delicately your tuyo. Get the zest of your lemon and the juice. Add the zest and the lemon juice on your frying tuyo. Put some pepper and dried basil herbs. Cook slowly over medium fire for about five to ten minutes. Ready your clean bottle container put gently your cook tuyo and pour more olive oil. You can keep this for about a month and can be used in other recipes. This dish sounds so flavorful and yummy. The picture is great. So scrumptious looking! That is a dish I love. Your version is amazing!